The International Neuromodulation Society (INS) is a non-profit group of clinicians, scientists and engineers dedicated to the scientific development and awareness of neuromodulation – the alteration of nerve activity through targeted delivery of a stimulus, such as electrical stimulation or chemical agents, to specific neurological sites in the body. 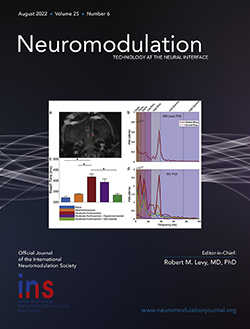 The San Francisco-based INS was formed in 1989 and educates and promotes the field through meetings, its peer-reviewed journal Neuromodulation: Technology at the Neural Interface, explanatory content, and chapter websites. The INS also provides information for patients and produces rolling news briefs about this rapidly evolving field. The INS journal Neuromodulation: Technology at the Neural Interface has a growing Impact Factor and is indexed in Index Medicus, MEDLINE and Pubmed from its first issue in 1998. Members may log in to the members-only section to read the journal online. Medical Professionals can learn about various considerations concerning neuromodulation and clinic contacts. Once your preliminary questions have been answered, please use the Contact Us facility to find out more and to discuss specific objectives. Others may simply wish to join the INS and one of its related chapter societies, please use the Membership Application. If you are not a medical professional and you are searching for information about neuromodulation and how these types of treatment could benefit a specific condition such as treatment-resistant headache or other chronic pain syndromes, you may find the sections titled Therapies, About Neuromodulation or FAQs particularly helpful. To see select neuromodulation news by category, as well as news about the INS in particular, please visit the Newsroom. To see archived news briefs dating back to January 2011, visit the News Archive.